The following species are fish that are often found in the sanctuary. The artwork and data are courtesy of the Massachusetts Division of Marine Fisheries, with information geared to vessel-based deepwater fishing. For more information about these species, see more detailed reports on the DMF Fish Profiles web page. These fish are the deepwater treasures of the sanctuary and coastal Massachusetts (a carving of a cod hangs in the Massachusetts State House). They are the number one fish sought after by party boats North of Cape Cod. They are found throughout the sanctuary and the Gulf of Maine, in deepwater and inshore while the water is cold. Baits and Lures: Sea worms, clams, mackerel, strips of all fish, crabs, jigs. Methods and Tackle: Bait-fishing from shore and boats, fishing from boats using medium to stiff boat rod, conventional reel and at least 50 lb test line. Although found primarily south of Cape Cod, an occasional black sea bass can be found in the sanctuary and in Cape Cod Bay. These migratory fish arrive in late spring. The majority of these fish begin life as females and thenchange to males at around three years of age. They prefer habitats with bottom structure, such as boulder reefs, rocky outcrops and wrecks. Baits and Lures: Cut squid, clams, green crabs. Methods and Tackle: bottom fish from a boat. anglers. Venture with an experienced shark angler to prevent unexpected surprises and make sure you bleed and ice the shark flesh immediately. Anglers are encouraged to release sharks not intended for consumption. All the tunas are very swift swimmers, provide a thrilling and sometimes backbreaking fight and are literally hot blooded. The giant bluefin tuna is the biggest and most lucrative of the tunas in our waters and thus creates much competition amongst fishermen. offshore in the rips. The juveniles, referred to as snappers, can be found in the estuaries and are fun to catch with light tackle. In all cases, they put up an excellent fight all the way to your boat or shore. Baits and Lures: All small bait fish, jigs, spoons, plugs, spinners, flies. Methods and Tackle: Casting from shore or boat (you may want to use a wire leader) with spin and fly fishing gear, trolling. State Record: 27 lbs- 4 oz. for the continuous dorsal fin to assist with identification. Baits and Lures: Same as cod. Methods and Tackle: Same as cod. State Record: 34 lbs - 4 oz. lateral line distinguishes it from the cod and pollock. challenging to reel up from deep water. Baits and Lures: Seaworms, clams, strips of fish, sandlance, jigs. Methods and Tackle: Fishing from a boat with medium to stiff rod. Baits and Lures: Small bait fish, crab, clams, seaworms, squid strips, jigs, spoons, flies. Methods and Tackle: Trolling, jigging, casting from shore or boat: light tackle. State Record: 3 lbs - 8 oz. fight. Venture with an experienced shark angler to prevent unexpected surprises and make sure you bleed and ice the shark flesh immediately. Anglers are encouraged to release sharks not intended for consumption. Methods and Tackle: Trolling, drifting; medium to heavy tackle, wire leader. The pollock is more available to the angler than its codfish relative. These aggressive fighters offer the thrills of a bluefish and the flesh of a cod. Season: May-October with the best runs in May, Oct.
small plugs, Kastmasters, mackerel jigs, metal lures with a strip of squid. cod. Lighter spinning gear can be used for inshore fishing. State Record: 48 lbs - 2 oz. 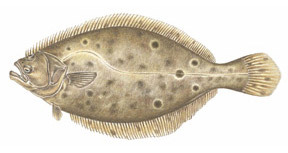 The winter flounder (black back) provides good fishing during the cold weather months. They are very accessible and provide the angler with thick fillets to take home. Baits and Lures: Sandworms, bloodworms, clams, strips of squid. State Record: 8 lbs -2 oz. Wolfish are distinguished by their large size, pronouned molar and canine teeth, and the lack of ventral fins. They do not school and prefer hard bottom, not mud, in deep waters. State Record: 55 lbs - 8 oz.